Do you live in Sevenoaks and need a new Boiler? We cover the Sevenoaks area as well as South East London. 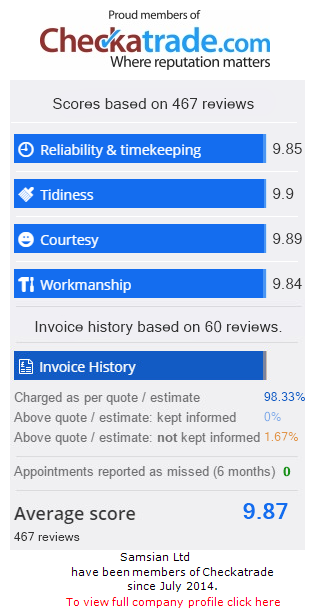 A family run business with top reviews & outstanding customer service. At Samsian Ltd, we understand how daunting even the thought of installing a new gas central heating system, boiler or combination boiler can be & that’s why we make sure the entire process from quotation & boiler replacement to handover is completed smooth and efficiently. The Survey – Our technical adviser will visit your home at a convenient time to discuss your requirements, noting any concerns or special requests you have. Once the adviser has discussed the basics of the boiler installation with you, a comprehensive survey will be completed which will enable us to advise you there and then of the most suitable efficient gas boiler replacement or central heating system that complies with all statutory requirements. The Quotation – Samsian Ltd believe in keeping things as simple as possible and just like our website, our quotations are free of gobbledygook, jargon and misleading information. Your free no obligation quotation will be prepared and sent to you the same day by email where possible further reducing our carbon footprint or it can be posted if you prefer. There are no hidden extras with our heating & boiler installation or boiler replacement quotations, everything is listed clear and concise, setting out exactly what is included. The Installation – On arrival our engineer will introduce himself, lay dustsheets and protective covers where necessary before work starts. The duration of your boiler installation is dependent on what you are actually having installed but in general, boiler exchanges are completed & commissioned within 1 day and average sized heating systems in 2-3 days. Our adviser will be able to give you an accurate estimate at the time of survey as will our engineer before starting work if you ask. The Handover – Immediately following the new boiler installation & commissioning, our engineer will set up and explain the operation of the new boiler controls together with the operation of any other new controls fitted. Once fully satisfied that you are comfortable with the information and understand everything, our engineer will leave you with the installation pack containing all the necessary manuals. The After Sales Service – We only use boiler manufacturers that are proven industry leaders, so apart from routine servicing the chances of you needing us after installation is extremely unlikely, however if something did go wrong, you can relax in the knowledge that your new boiler will be backed by a written guarantee which is up to 7 years on selected models & we offer a priority breakdown service for all customers that have had a new boiler installed by us. All new gas boiler replacement installations come with a free gas safety inspection and service on the anniversary of installation too. For a local & reliable gas boiler installer covering Kent & South East London who can quote to meet all budgets, call Samsian Ltd 01732 885882.